Which games are on your child's wish list and why? Which age rating categories are OK for your child to play, which require permission and which are off-limits and why? Are there specific types of content or content descriptors that are off limits? Should your child receive your permission before playing a game online? What about playing in tournaments? Are there rules regarding whom your child can play with online? 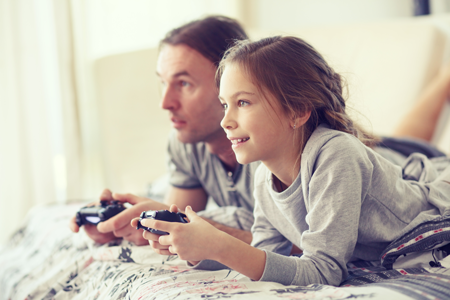 Has your child ever seen or heard inappropriate content from other players when playing a game online? Does your child know never to give out personal information to anyone online they don't know? What is the highest rating allowed? Have you also set restrictions on chat, Internet and browser access, amount of time or with whom your children can play online? Are there other house rules regarding which games are allowed and when and how long they can be played (e.g., number of hours each day, and/or only after homework and chores are done)?